Photo courtesy blog: Barlow Brewing. Belgian scientists are looking to slow the development of trans-2-nonenal in beer. That is, keep beer fresher, longer. From the Wall Street Journal: http://bit.ly/18ibp1. Press release from former imprisoned journalists: "We were violently dragged to North Korea." http://bit.ly/v8lWL. 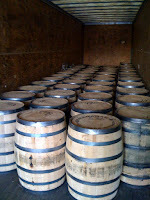 Photo of newly arrived used bourbon barrels at Flying Dog Brewery in Frederick, Maryland. To be filled with Gonzo Imperial Porter. http://bit.ly/9BmES. 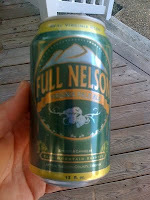 Craft Beer goes mainstream! Via @SaranacBrewery: "Saranac Brewery" was the answer in a New York Times crossword puzzle, 8/20, no. 23 down, to the question: "CraftBeer made in Upstate NY?"